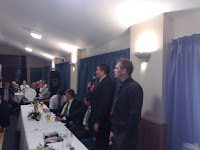 We had a top night at Marple Cricket Club's annual dinner on Friday. I always think cricket lads are a good laugh. By and large the banter is sharper than football and not as lewd as rugby - I've never fancied drinking piss out of a sock. Bizarrely, most of the auction prizes were football and boxing bits and pieces. The speaker was Jeff Winter, the ex-ref, who was a late stand-in for Jonathan Agnew. He signed copies of his book and told stories about his refereeing days. He was very good, but to be honest I can't remember much as we rather hosed it down. Jonathan Agnew would have been better though, wouldn't he? Jeff Winter was a rubbish ref and yet nowadays he's the first person Sky ring up to talk, ironically, about rubbish refs. I've discovered a recording of Jeff Winter's talk on my phone. It mainly consists of him swearing a lot and name dropping people he doesn't like. And lots of me and Harvey laughing. You can't hear Mark Oldfield, presumably as he has one of those older bloke laughs where his mouth opens but no sound comes out.